South Delhi Polytechnic for Women, Lajpat Nagar has been imparting Vocational Training in 18 disciplines, for more than half-a-century. Fashion Design & Merchandising is now perhaps the most popular profession, leading to employment, placement and empowering women in large numbers. We are also proud to mention that we were the first to commence the Fashion Design as a Course Programme this as an academic programme under our Founder Director Late AshimaChaudhuri in 1974 ~ in the capital city of India! 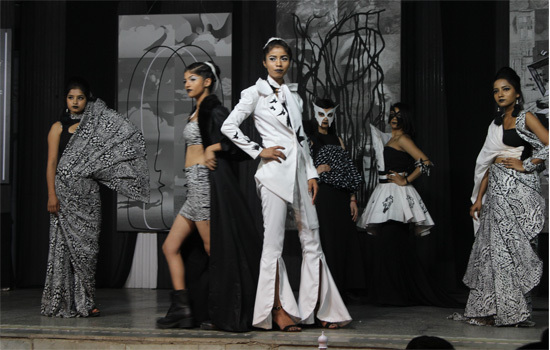 under the aegis of the Principal VeenaSaith, Head - Fashion Design & Merchandising, the 26 senior–most students worked on the challenging theme of ‘Black & White’ tones. The final execution was walked on the Ramp @The AshimaChaudhuri Auditorium by 78 student models. The Presentation was titled as ‘The Black & White Brigade’. The theme portrayed a bold, modern and fresh look. Student Designers have played and created in both artistic terms and with artistry ~lines, checks, dots, shapes, flora and fauna, but in shades of Black & White solely. The amalgamation and expression of these dichromatic tones is indeed eclectic and praise-worthy. The titles of the 13 sequences and Designer names are given in the attached brochure.